Great to see more mobile suits in production. Anyway, its nice to see someone actually made a gundam mod for this game. Looks good. A little suggestion tho. -Man Rodi and Landman Rodi have hand grenades on them. Maybe a standard bomb bay to mimic it? -Bazook variants for the Graze and Shiden units. A quick question, are they also implemented to be used by the NPC fleets? Been running around in the sector for 3 game years and still haven't encountered a fleet that uses them. Hmmm, I'll try to work in the grenades for the rodi's and bazookas for the other two. They should be, I set up variant files in the faction list. They could just not be used for some reason, if that's the case I'll prob just have it set up to not use vanilla variants. Now that I think about it, the Mobile Armor could pair pretty well with the Remnants. Both killer AIs after all. The Mobile Armors should be able to fight teeth to teeth to the heavy wanzers. And since Tartiflette made the wanzer more animesque (sword-wielding mecha, anyone? ), maybe you can follow up with the more exotic mobile suits mechanics-wise. Well, the gundams will mainly be melee only with a few mobile suits having a melee option, but I'll wait a bit to really get into fiddling around with it and prob look at tart's stuff for reference when I do. Setting up the animations doesn't seem too difficult, it's just mainly figuring out how exactly they'll swing since the main melee robits use two handers. Speaking of melee, are the mass production MS getting melee weapons as well? Once I get started on it I'll probably change the ones with a hand free to carry a melee weapon, like an axe for the graze types, and add in some alt versions for the rest. -Added in new ship, Isaribi. Should appear with the independent currently. -Fixed factions not actually using the variant files to have mobile suits. -Added in bazooka version for Graze types and Shiden. -Changed rodi types to now carry grenades for the left arm. 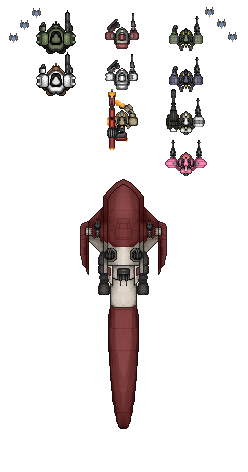 Small little update, fixed a problem with the Isaribi where it had two launch bays but both counted as one and would cause the ship to be immovable. Slight new update, buffed the isaribi a bit and added some more flare launcher ports. ...Dang it, just when I finally got diable to warm up to me (Raising reps with them is not that easy, and the sector generation only spawned 2 markets). Anyway, that's one fast work. Love the Isaribi. Though is it me or it looks thin? Ah well, more carriers, the better. Time to start a new game...Save transfer update for 0.8 when!? So, I looted a research station wreck and wound up finding a hullmod skill book for the Alaya-Vijnana System. I'm guessing this isn't supposed to drop! I justo got this from a weapons cache.... needless to say, absurdly op (1250 DPS!!?).... I guess I was not suposed to get this?